Do you know someone who was born in 2007, 1995, 1983, 1971, or 1959? If so, let them know that 2019 is their year because once again it’s the year of the pig! Chinese New Year is coming up fast, so don’t delay and send this card to those you know and love. It’s not just pigs who can take advantage of all the good fortune ahead, but anyone who knows how to grab it. Welcome the Chinese New Year with wide arms! 2019 is the Year of the Pig, a year categorized by numerous social engagements and support from all parts of your life. For older pigs, this is the year where fortune will smile on them. What they have been striving for will come to pass. Support your friends and love your family by sending them with Chinese New Year Card! 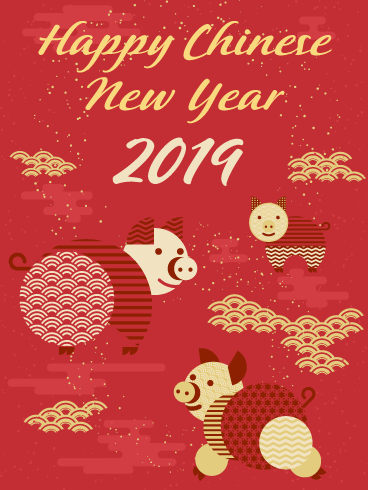 Make 2019 fabulous with this Chinese New Year card! It's the year of the pig, the zodiac sign that stands for wealth and fortune not just in terms of money, but also in friendship, family, and love. Whether the person you send this to is a pig or if they were born in another year, ensure they have a prosperous 2019 by sending them this card. 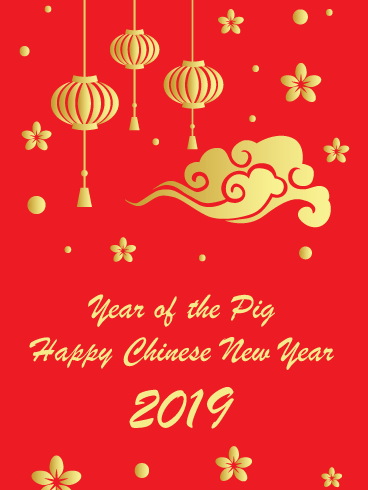 Welcome the Chinese New Year with this incredible card!2019 is the Year of the Pig, otherwise known as the Year of the Boar. The pig is the 12th zodiac symbol, a sign of wealth and prosperity. 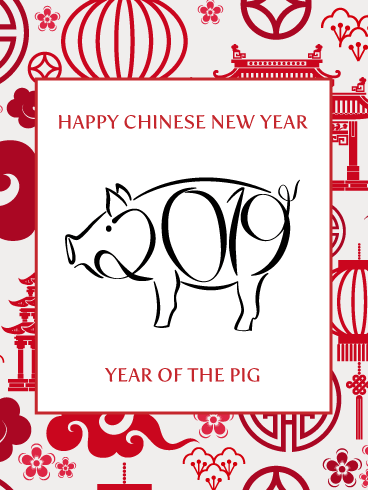 Let your friends and family know that you are thinking of them and gifting them the pig’s good fortune so they can have an incredible Chinese New Year! 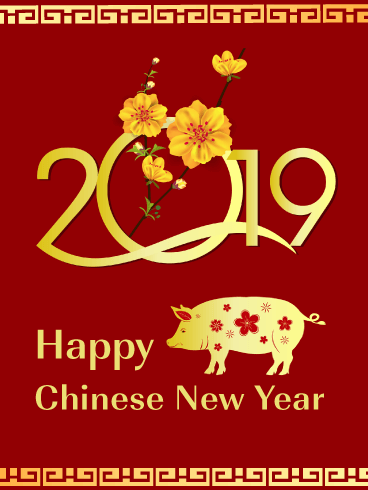 2019 is the Year of the Pig, so gift your friends and family a card full of wealth! Just as those who will be born in 2019 (or were in 2007, 1995, 1983, 1971, or 1959) have pig characteristics (a good personality, a well-balanced mindset, incredible luck), so too will this year be a fortunate one even if you weren’t born in a Pig year. Give everyone you know a jump start to a prosperous year by sending them this card! Start the Chinese New Year with your best foot forward! The Pig is the last member of the Chinese Zodiac. He has witnessed the procession of those before him and learned all of their lessons. This is why those born in Pig years are known for good fortune. Help those you know put their own knowledge to good use, and make this year incredible by gifting them this beautiful Chinese New Year Card! 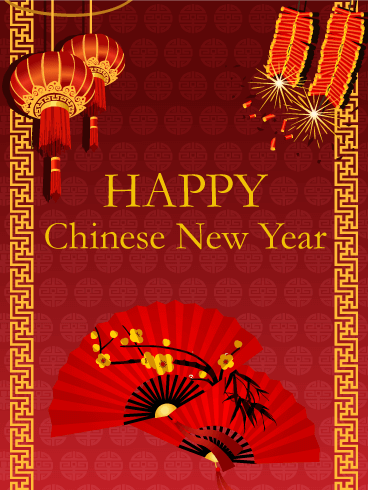 Celebrate the Chinese New Year in style by sending this elegant card! This happy pig and golden hanging lantern are guaranteed to attract good fortune and good health, the perfect gift to those you care about. New year, new life, new opportunities. Send this card to your family, friends, and coworkers so they can have a fruitful 2019! Together, your success will grow. 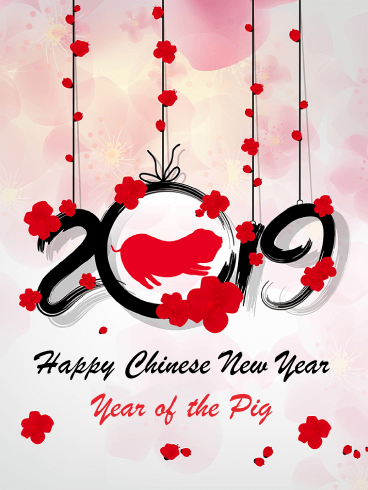 Celebrate the year of the pig with this adorable card! The Chinese New Year is around the corner and 2019 will be the year of the pig. 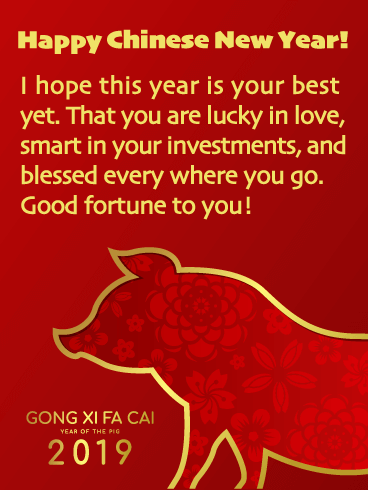 Wish those you love a year of wealth and good fortune. This is a year of great change, and you want to make sure it changes their life for the better! So send this Chinese New Year card and build up the fortune of those you care about. Kickstart everyone’s new year with these wishes of good fortune! Those born in the Year of the Pig are considered to have a beautiful personality and good fortune. They understand the balance of desires and needs. For the Chinese New Year this year, send those you love the mindset of a pig to ensure they have a truly auspicious year. 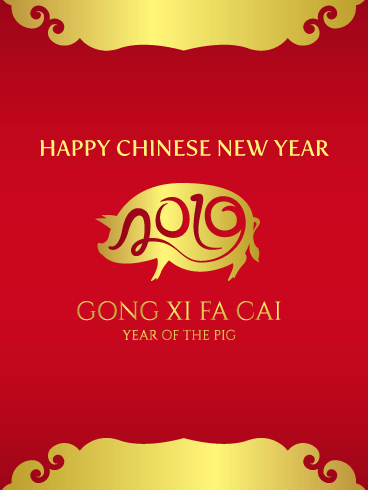 Celebrate the Year of the Pig by sending this beautiful card to your favorite people! The Pig is the 12th member of the Chinese Zodiac, a symbol of wealth and enjoyment. Those born in the year of the pig are usually enthusiastic and friendly. Let your friends and family know that 2019 is the year you will spend lots of time together having fun. This 2019 Chinese New Year card is filled with spectacular elements such as a fabulous golden pig decorated with flowers, a stunning golden border, fancy lettering, and yellow flowers that look fantastic! 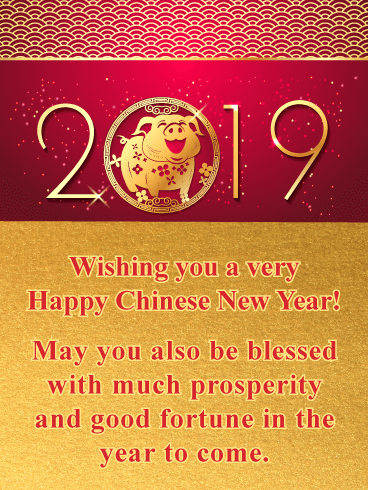 There would be no better way to wish someone good fortune for the year 2019 than with this red and gold Chinese New Year card. So be sure to send it on its way because it will certainly add joy to someone’s day! 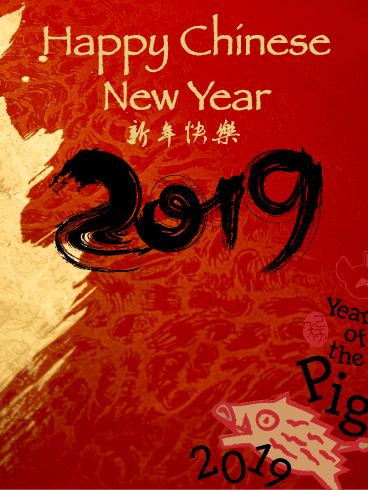 The year of the pig is among us and this Happy Chinese New Year card certainly represents this in a beautiful way. An elegant pig is seen walking through little white flowers in a decorative circle. It looks amazing! Larger red, white, and golden flowers are also displayed and they make this Chinese New Year card extra special. Wish someone enlarged wealth along with much happiness with this delightful greeting card! 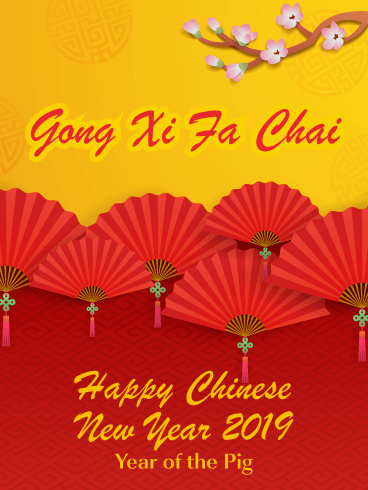 If you are looking for a lovely 2019 Chinese New Year card to send to all those who celebrate this wonderful holiday, then you have just found it! This greeting card features stunning Chinese New Year colors such as gold and red, and displays sensational fans, along with pink flowers. They all come together to create a delightful Chinese New Year card that can be enjoyed by anyone. 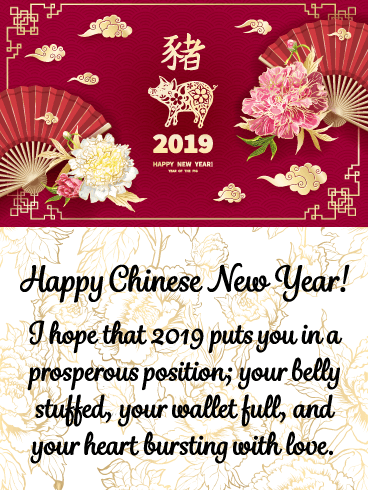 Honor the year of the pig with this fabulous greeting card today! 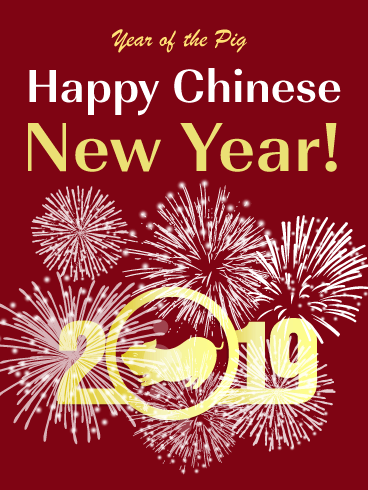 This joyous Happy Chinese New Year card will bring a smile to someone’s face as they enter 2019! 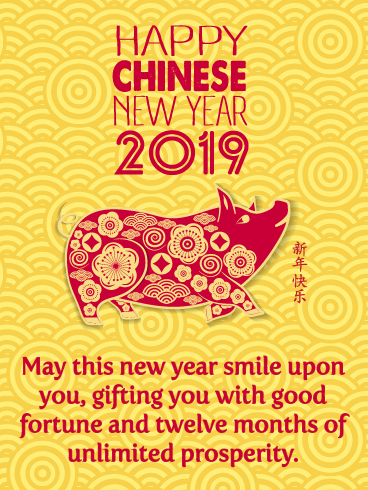 It will also send wishes for enlarged wealth as they usher in the year of the pig! It features traditional red and golden yellow colors that form an image of a decorative pig and flowers. It looks amazing and no matter who you send it to, they will love it. 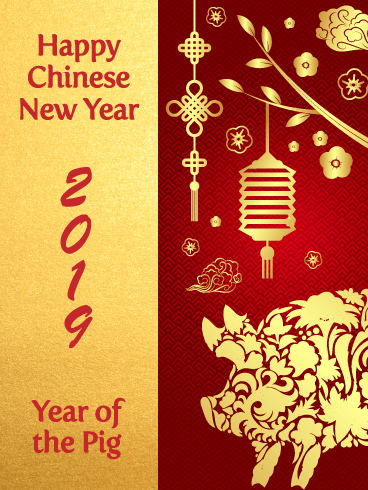 Honor the year 2019 with this stunning Chinese New Year card! 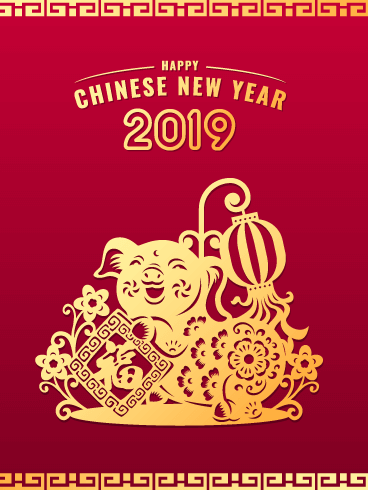 Lanterns are an important element when it comes to Chinese New Year traditions, and that’s what makes this greeting card perfect for sending to your friend or loved one for the year 2019! The lanterns look exceptional, as do the golden flowers. 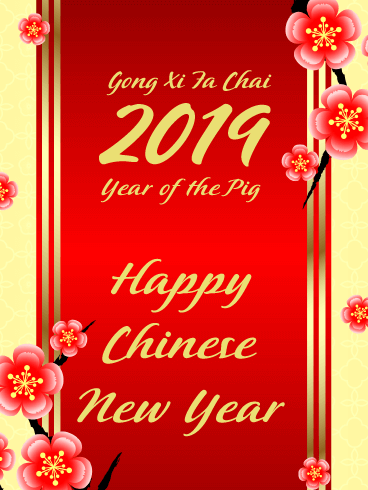 2019 is the year of the pig which is very important to many, so be sure to honor this holiday the right way by getting this outstanding Happy Chinese New Year card out to someone special today! Celebrate the upcoming year with some flair by sending this artistic 2019 Chinese New Year card to someone you care about today. Chinese flowers decorate the ropes that hold the impressive numbers that form the year that is being honored. 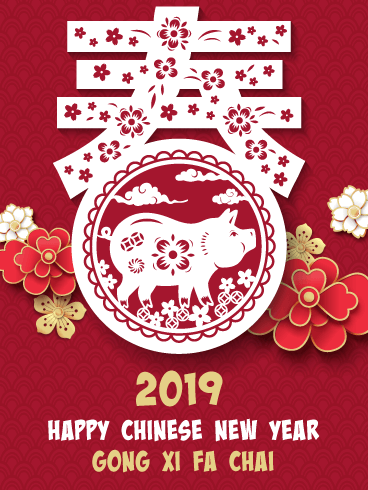 2019 is the year of the pig and so it is fitting that an amazing image of a pig was creatively included in this Chinese New Year card! 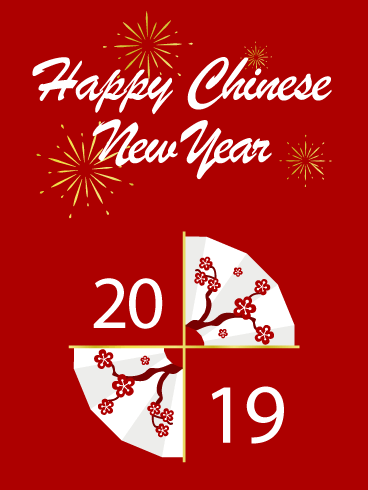 Send an absolutely stunning Happy Chinese New Year card for 2019 to let someone know you are thinking of them! Designed with reflective gold, red, and yellow, this greeting card has an upscale look that will impress anyone! Beautiful flowers line the edges and fancy lettering fill this Chinese New Year card and make it even more special. If you know someone who will appreciate such a magnificent greeting card, be sure to send it to them today. 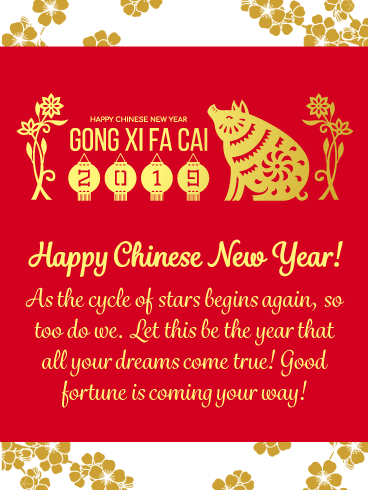 Send out wishes for someone you care about to be blessed with prosperity and good fortune for the year 2019! This dazzling Happy Chinese New Year card will let someone start the new year the right way. It showcases a wonderful image of a golden pig, reflective numbers that form the date 2019, and sensational sparkles! The golden background adds a stylish look to this Chinese New Year card and it will be enjoyed by anyone who receives it! May your happiness be without limit in this coming year! 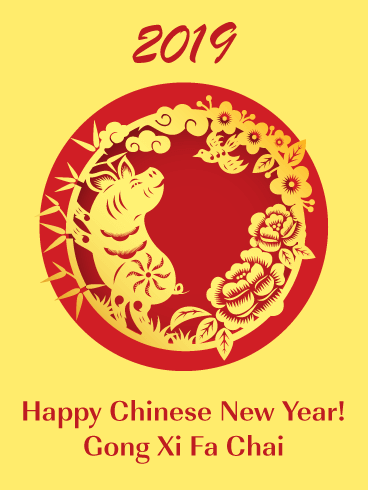 As the holiday approaches, send this Chinese New Year card to celebrate all the best parts of the New Year celebration! The decorated paper fans, crackling fireworks, and tasseled paper lanterns will bring to mind the celebrations of years past as you welcome in this new start. Use this Chinese New Year card to wish good fortune to your loved ones this year!